Definition of Kokopelli: What is a Kokopelli? Kokopelli is a legendary supernatural creature that features as a fertility deity in the stories, myths and legends of the different Southwest tribes of Native American Indians, notably the Hopi and the Zuni. Kokopelli is usually depicted as a hunchbacked, dancing flute player and minstrel wearing antlers or horns on his head. In Native American traditions antlers and horns signified spiritual power. Occasionally Kokopelli is also depicted with a large phallus reflecting his role as a fertility spirit and. Kokopelli was believed to be a spirit who brought a sense of security and well-being to the people, assuring their success in hunting, growing crops and in human conception. Kokopelli is an ancient deity and pictures have been found on prehistoric American rock carvings, petroglyphs and pictographs of the Southwest dating back thousands of years. The Kokopelli deity is associated with the Mississippian mound builders culture that flourished in what is now the Midwestern, Eastern, and Southeastern United States from approximately 800 CE to 1500 CE. The Kokopelli deity is also associated with the Anasazi culture who were builders of the ancient cliff dwellings found in the canyons of the Southwest. From this association Kokopelli has been given the nickname "Casanova of the Cliff Dwellers". This idea continues with the Hopi as in their legends Kokopelli carries unborn children on his back and distributes them to women. For this reason, young unmarried girls often fear him! The term 'Kachinas' can refer to spirits, dancers and carved dolls. There are many Kachinas that feature in Hopi ceremonies and dances and Kokopelli is the most famous of all. 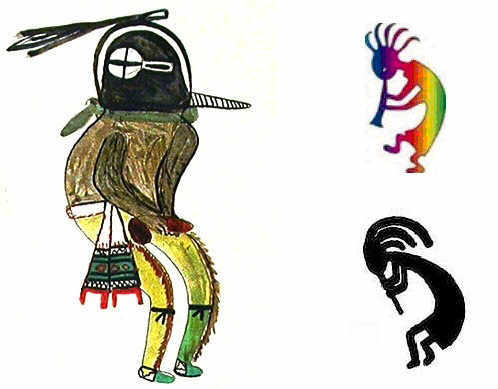 The picture at the top of the page depicts a Kokopelli Kachina drawings made by a Hopi Indian. On top of his head is a warrior feather connecting Kokopelli to survival through war. Among the Hopi, Kachinas are understood to have human like relationships and may marry and have children. The wife of Kokopelli is called Kokopelmana by the Hopi. Kokopelli plays an important role in ceremonies and rituals relating to marriage. The "Rainbow Kokopelli" is a Yei deity who commands the rainbow, giving beauty and joy to all those in harmony. This derives from the idea that his sack was made of clouds full of rainbows or seeds.